Hands-only CPR doesn’t require certification, but make sure you learn the right technique from a trained professional. 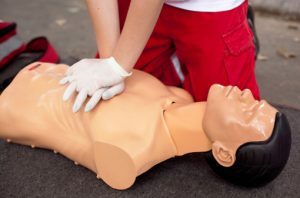 CPR, or cardiopulmonary resuscitation, is a life-saving technique developed in the 1960’s that quickly became a staple of workplace safety training. With as little as an hour of training, employees could learn how to aid co-workers whose breathing or heartbeat has stopped. Recently, hands-only CPR has started to gain prominence as a way for untrained individual to help those in need until medical personnel arrive. While the technique is simple and doesn’t require certification or training, be sure to review proper hands-only CPR technique from a medical source. Hands-only CPR utilizes the chest pumps of traditional CPR, but removes all of the hard to remember and timed steps of the older version. If you remember the Bee Gees hit “Stayin’ Alive” from the 1970’s (or Queen’s “Another One Bites the Dust,” if you’re a pessimist) you only need to follow the chorus to get the correct rhythm to keep the heart pumping blood to the brain. There are plenty of sources online that outline the proper way to perform chest compression, the best way to learn is in-person from a medical professional certified in CPR. This entry was posted on Friday, July 15th, 2016	at 8:58 am	. Both comments and pings are currently closed.